Since 2014, the pound has accepted a large number of kittens during the kitten season. The majority of these come in without their mother. Some are still in need of bottle feeding. Others are barely weaned. With over 800 passing through the gates, foster homes are the best chance for our kittens. Without our network of foster homes, a very high percentage of our kittens do not stand a chance: they are so vulnerable to infection that cat flu, typhus and other cat diseases pass rapidly between them. In 2014, treating thirty or forty kittens twice a day for cat flu, cleaning noses and helping to wean them took up the majority of our cattery staff’s time and cost many little lives. In 2015, with a growing number of foster homes, we could limit infection and many lives were saved. Not only that, growing up in a home is vastly different than growing up in the refuge. Our kittens left our care healthy and well-socialised, with a great care package from the refuge for their future. For this reason, kitten foster homes are in hot demand. With five hundred kittens expected in 2016, at least fifty foster homes are needed. The more we have, the better chance our kittens will have. Being a fosterer for kittens is a very rewarding experience if you cannot have cats yourself or if you are not based in France full-time. It largely depends on how old the kittens are. For younger kittens, they have a longer stay. Kittens arriving aged 7 weeks have a brief stay of 8 days to ensure they are not carrying any diseases, and then they can be vaccinated, chipped and advertised for adoption. Ideally, it is best if they stay in foster care until they are 14 weeks after their second vaccinations, although many are adopted after their first vaccinations. For younger kittens, they cannot be vaccinated until they are at least eight weeks, so their stay is a little longer. From time to time, we have kittens younger than three weeks arrive at the pound. In such cases, it’s better if less experienced foster carers take over older kittens and allow more experienced foster carers to take over hand-feeding. You will need a spare room which can be isolated from other animals. Although you may have cats or dogs, it’s important that they do not come in contact with kittens until at least the first vaccinations as the risk of infection is very high. This is also important since many kittens arrive with fleas, but cannot be given any flea treatment until they are 8 weeks old, so the risk of fleas passing between animals is high. A spare bathroom or bedroom is lovely. Kittens can get messy, so the easier it is to clean, the better. It will need to be kitten-proofed – kittens have a remarkable ability to get into very small spaces, dryers, behind cookers etc and you will need to make sure the kittens will be safe. The room will also need to be sanitised between kitten families, which makes a spare bathroom or utility room ideal. Everything else will be provided for you by the refuge, from milk and kitten food to litter and worming treatments. Flea treatments, medicines and the likes will also be provided by the refuge. Bowls, toys, bedding and cat carriers are also provided. You’ll also be given lots of guidance and support including a training session by an experienced kitten fosterer. We do ask that you look after our little ones and take good care of them. That may involve giving eye drops or wormers. It also involves handling them, playing with them, cleaning them and photographing them. If it’s your first time, we can make sure you’re given kittens who are a little older and who are much more self-sufficient. We do ask that you are within a short drive of the refuge, since all veterinary care must be undertaken either at the refuge or by one of our partner vets. Once the kittens have been vaccinated, if they have not been adopted, it is much safer to return them to the refuge, where potential adopters can see the kittens that we have available. Foster care is not intended to be indefinite: we do not expect you to keep the kittens until they are adopted, or to advertise them or find homes yourself. Every volunteer must fill in an information form, provide proof of civil liability insurance and sign a copy of these regulations to show that you understand them and agree with them. The refuge will also sign the regulations. All minors must be accompanied by one of their parents who must also sign the regulations. All new volunteers must be accompanied by an experienced volunteer for at least their first few visits and must agree to the following instructions. As volunteers may be the victim of an accident, or may cause an accident involving another volunteer, insurance documents must be submitted at the beginning of each year as proof that you are personally covered by civil liability insurance for the year. The signed copy of the refuge regulations along with your personal information sheet and a copy of your civil liability insurance will be kept in a file at the refuge. These are available to you and to any of the staff or those responsible for volunteers at the refuge. Whatever tasks you undertake at the refuge, you must follow the direction and guidance that is on display around the refuge. You do not have the right to give orders to members of staff, nor to criticise their requests either in front of them or in front of visitors. Each volunteer must respect other volunteers. Any member of the steering committee has the right to ask a volunteer to stop what they are doing and forbid them from accessing the refuge site. The volunteer may ask to meet the steering committee, although in such matters, the opinion of the steering committee carries the most weight. The animals of the refuge can carry illnesses and diseases. It is therefore advised that you change your clothes and disinfect your hands and the soles of your shoes before returning home or touching your own animals. It is also advised that you keep your own animals’ vaccinations up to date. You should also ensure you are up to date with your own tetanus vaccinations. The majority of our dogs have often had a miserable or distressing past. As a consequence, we ask our volunteers to be conscious of this and to consider their actions before getting involved in our association. Many people ask why there are adoption tarifs. The reason is simple. Adoption fees account for almost a quarter of the refuge income, and without it, we would not be able to accept as many animals. Your fee allows us to pay it forward and invest in new arrivals. Think of it less as an adoption fee and more as a donation to support our work. The tarifs vary as well. Pedigree dogs, even ‘second hand’ ones, are easier to rehome and fewer and further between. Female dogs are more expensive because their sterilisation is more costly than a castration. Older dogs do not have such a high tarif as we are mindful that they will no doubt have vet’s bills from time to time. This is true of young dogs too. The sad fact is that many people would not think about adopting an eight-year-old dog and the tarif reflects our desire for them to be rehomed. Dogs over the age of 10 benefit from the support of Fondation 30 Millions d’Amis, a French charity who will settle vet bills up to an amount of 600€. Their condition for doing so is that the refuge do not accept more than 50€ in donation for an oldie. The same question arises over kitten costs. The fact is that to chip, vaccinate and sterilise your kitten, it will cost you roughly three times what is asked for as a fee. There is NO such thing as a free kitten, unless you intend to go without doing one of these three steps. If you go without sterilising them, you are contributing to an earlier death, since unsterilised cats have an expected lifespan that is four years shorter than a sterilised cat, or adding to the likelihood of their straying in search of a mate. If you go without vaccinating your cat, you open them up to the risk of a variety of preventable infections, some of which have a 60% mortality rate. Even if you do not wish to vaccinate your cat through to old age, all vets recommend the first set and the booster. Finally, an unchipped cat has no way to find its way home to you. With over 100 cats at the refuge at any one time, there are no doubt owners who think their cat is long dead when in fact, they are waiting for a home. 95% of cats that arrive by the pound are unchipped. Only a small number of these are truly feral. Only by missing out on all three essential kitty costs would you actually save yourself money. All dogs leave only on the understanding that you will have them castrated at your earliest convenience and provide a statement to that effect from your vet. All puppies leave with a voucher for obligatory sterilisation. All cats older than 4 months are tested for feline leukaemia and FIV. For dogs or cats, these prices reflect the cost of their vaccinations and their identification. All animals leaving the refuge have been given standard vaccinations and are identified. Many people ask about the paperwork they need to complete after adoption. The answer is: none! We fill in and update the ICAD records for dogs and cats, which generally takes about 3 weeks to come back with your name on. Should your animal go missing in that time, if found their chip will still have the refuge contact details and we will be able to get in touch with you. Sometimes, you will have a home visit in the case of certain dogs. Sometimes the refuge may ask to do a pre-visit as well. This is usually only with animals who we know will be problematic. For dogs who come in via the pound, there is an obligatory 90-day health check to ensure that they are in good health and not presenting signs of infectious diseases. You can contact the refuge by calling 05 45 65 76 99. Please be aware that the answer machine is in use outside the hours of 1.30 – 5pm because the refuge does not have a dedicated receptionist to deal with calls outside of these hours. The refuge is open to the public from 1.30pm – 6pm in the summer, and from 1.30pm – 5.30pm in the winter. We are open from Monday – Saturday. The refuge is often busiest on Saturdays. If you would like to meet a particular dog or cat, it is always worth letting us know so that we can make arrangements. It is most easily accessible from the N141 dual carriageway from Angoulême to Limoges. Follow signs for Angoulême. Follow signs for Limoges/Ruelle to continue onto the N141. After Ruelle, you will see signs for Mornac/Pranzac/Les Rassats. Follow signs for Mornac, passing through Puy de Nanteuil. Ignore the sign for Mornac (bourg) and continue on this road for 3km. After the town marker for Mornac, the road narrows for traffic calming. Just after this, you will see signs on the left for Refuge/SPA. Turn left here. Follow the road for 500m and follow the second sign for the refuge by turning right. After 200m, you will see the refuge gates. You can park outside or on the road just outside of the refuge. Follow signs for Angoulême, passing the town. After signs for La Grande Prairie/Plan d’Eau, follow signs for Limoges/Ruelle to continue onto the N141. After Ruelle, you will see signs for Mornac/Pranzac/Les Rassats. Follow signs for Mornac, passing through Puy de Nanteuil. Ignore the sign for Mornac (bourg) and continue on this road for 3km. After the town marker for Mornac, the road narrows for traffic calming. Just after this, you will see signs on the left for Refuge/SPA. Turn left here. Follow the road for 500m and follow the second sign for the refuge by turning right. After 200m, you will see the refuge gates. You can park outside or on the road just outside of the refuge. Follow signs for Angoulême, joining the N10 after Fléac and following signs for Poitiers and Limoges. After signs for La Grande Prairie/Plan d’Eau, follow signs for Limoges/Ruelle to continue onto the N141. After Ruelle, you will see signs for Mornac/Pranzac/Les Rassats. Follow signs for Mornac, passing through Puy de Nanteuil. Ignore the sign for Mornac (bourg) and continue on this road for 3km. After the town marker for Mornac, the road narrows for traffic calming. Just after this, you will see signs on the left for Refuge/SPA. Turn left here. Follow the road for 500m and follow the second sign for the refuge by turning right. After 200m, you will see the refuge gates. You can park outside or on the road just outside of the refuge. Follow signs for Angoulême and passing by Chabanais, Roumazières-Loubert, Chasseneuil and La Rochefoucauld. Join the dual carriageway at Chasseneuil and continue on for 15km. At the sliproad for ZE de la Braconne, Les Rassats, Camp Militaire, turn left. Continue over the first roundabout towards the ZE de la Braconne. Join the industrial estate by continuing over the second roundabout. Pass the industrial buildings and follow the road around a sharp bend to the right after 1km. Follow the road for another kilometre. When you pass through the gates to the industrial estate and see the stop sign, turn left here. After 200m you will see the refuge gates. You can park outside or on the road just outside of the refuge. The refuge de l’Angoumois is situated on the edge of the Braconne forest in Charente, France. The forest is home to a number of wild animals including boar, deer, marten and rabbit. During World War II, the site became an important location for the local resistance and after the war, the American Army base built on the site hosted a number of troops. When the base closed in the 1960s, the base was turned into an industrial zone. The site of the refuge was used to house the Army’s German shepherd patrol dogs and was taken over by the refuge in 2007. 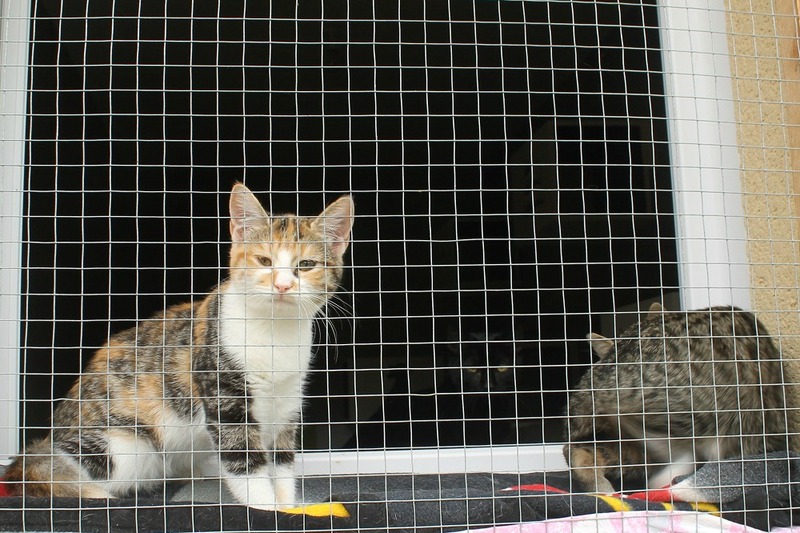 Since then, a number of important donations have led to the building of a purpose-built cattery, meaning the old mobile homes that used to house the cats have gradually been removed. Currently, the fourrière de l’Angoumois (the pound) is based on the same site, although the refuge and the fourrière are distinctly separate entities. The pound is funded by local councils to ensure stray animals are dealt with. 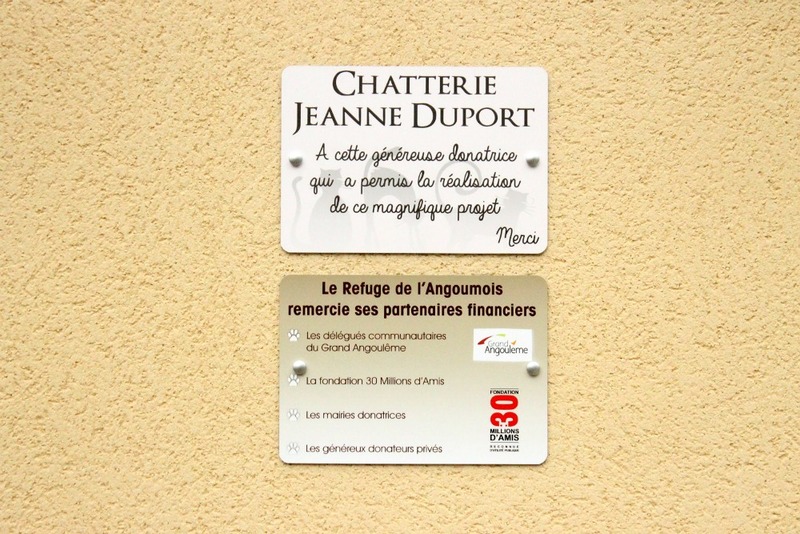 The refuge is funded by donations with some subsidies for employment contracts. The refuge is based around one long run of enclosures called ‘grand bat’ (grand bâtiment) which has fifty-seven enclosures, two isolation rooms and a quiet room for convalescence or nursing mums. Besides the reception area, there is also a kitchen, the admin office and a vet’s office/grooming room. There are four ‘satellite’ blocks which have six enclosures each. There are a number of outside pens complete with kennels which have more space for dogs to run or to let off steam. Some of these are almost permanently occupied by larger dogs who find the main enclosures too difficult or stressful. At any one time, there can be up to two hundred dogs on site or in foster care. For the past three years, the refuge has accepted and rehomed more than five hundred dogs a year. Eighty percent of dogs arrive from the pound. Ten percent are animals that have been seized by the authorities. The final ten percent are dogs who have been abandoned at the refuge. We work hard to ensure the refuge meets animals’ needs: they have high-quality food, they have on-site vet treatment, they have shelter and warmth. For many animals this is more than they have ever known. Stress is always a difficult factor to mitigate, but volunteers and staff are on hand to walk dogs, to spend time with dogs and to try their best to make the refuge as pleasant as possible. 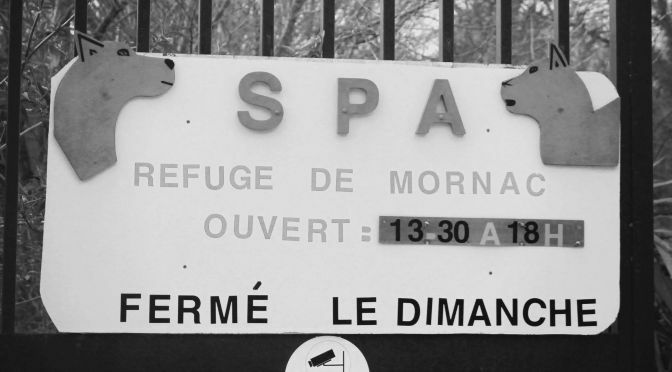 The Refuge de l’Angoumois is a no-kill refuge. No healthy dog is euthanised. The old and infirm are given medical care and even if they are very near the end of their life, all efforts are made to ensure they spend their last few weeks in comfort. Very occasionally, the refuge will be asked to assess the behaviour of dogs who have been seized for aggressive behaviour, attacks on other animals or serious bites. Of these, the majority are rehabilitated. Numbers for the cats are inflated due to the sheer numbers of kittens that come in via the pound. In a twenty-four week period in 2014, the refuge accepted more than seven hundred kittens. Many are orphaned, need hand-feeding or arrive sick, weak and on the verge of death. Sadly, there are many deaths simply because with fifty kittens on site, all too young to be vaccinated, their chance of fighting off diseases like cat flu, infectious peritonitis or typhus are minimal. We depend on foster carers to keep disease down as well as socialise kittens and give them the best start. The refuge also works as a point of reference for other local agencies including town councils and the police when investigating claims of animal neglect or abuse. At any one time, a number of dogs will find themselves part of a court case. Preparation for trial is costly and laborious. In 2014, 160 dogs were seized from a dog breeder in Juillaguet. It came to court two years later following the submission of documents for each and every dog. Four other cases were seen in 2014, all resulting in successful prosecution. The same is true of 2015. Most of the refuge funding is divided between three areas: vet fees, animal food and staffing. Financial donations and practical donations of food and bedding are always welcome.